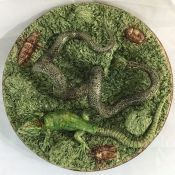 Discover our Selection of antique and vintage Majolica Art Pottery. For a Greater Selection of Majolica Please Contact Us or Visit our Shop. Victorian majolica jardinière with vivid colours and featuring the depiction of a mule and a brick motif. Sits 18 cm high. Pair of green glazed majolica foliage patterned jardinières. They each sit 15 cm high. Umbrella stand with grapevine decoration and vibrant glazing. The piece is 23 inches tall.